29 The Parrott Building, built in HK, re-constructed in San Francisco? I am a writer interested in building stone. 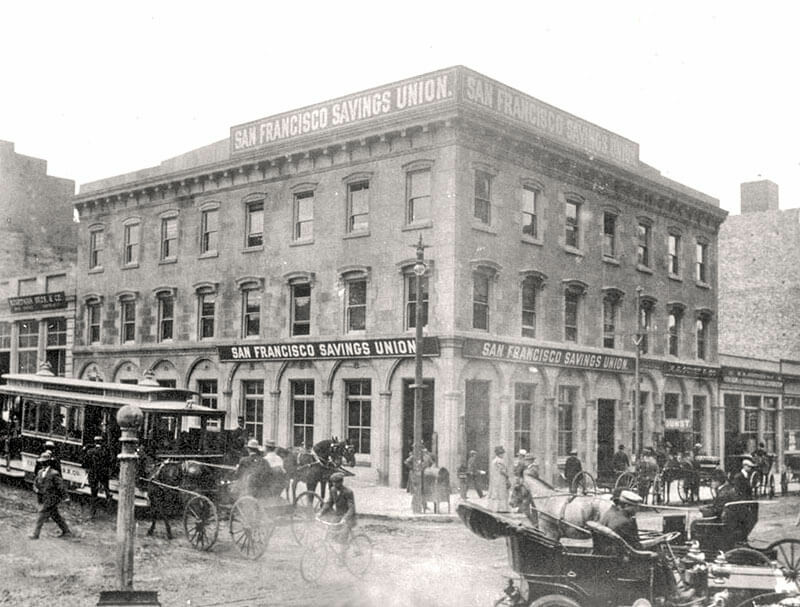 I have been researching the Parrott Building in San Francisco. Built in 1852, it was one of the first stone buildings in the city. I know that the builders of the building were Chinese and have read that the stone came from Hong Kong. One source says that the building was built in Hong Kong, dismantled and then sent to San Francisco. I believe that the stone for the Parrott block was acquired by Bernard Peyton through the firm of Jardine, Matheson and Co. The stone that was acquired was then put on the barque Dragon, which arrived in San Francisco on August 4, 1852. I think it took 52 or 54 days to cross the ocean, which means it left Hong Kong around June 14 or so. I was wondering if you had heard of the Parrott Block and might have any insights into granite quarries in Hong Kong in the 1850s. Could the building have been erected in Hong Kong and then taken apart and shipped to San Francisco? David adds: One of things that I wonder is about how the stone got to San Francisco. As noted it came on the Dragon but I don’t think that it was that big of boat. I am not sure but think it was a 290 ton boat that was 105 feet long. How did they get enough granite on the boat to build the building? Or was there more than one ship involved? Stephen Davies comments: The building does not appear to be entirely built in granite. The window bays, ground floor footings and other decorative bits look like stone. Much of the rest looks more like rendered brick. That said, schlepping building material around the world was quite common in the 19th and even early 20th centuries. More than a few HK buildings were built of British bricks shipped out as ballast. Some very early HK buildings used granite shipped up from the Philippines. So in principle the stone could have come from HK. Pacific Crossing: California Gold, Chinese Migration, and the Making of Hong Kong, E Sinn, Hong Kong University Press, 2013. The book “Old San Francisco: the biography of a city from early days to the earthquake” apparently discusses this, although it doesn’t mention Hong Kong specifically, but rather a more general “China”. En el semanario “Hispano- America” de San Francisco hay una nota el 6 de febrero de 1926 ( p.1) en la que se dice que un tal H.M. Furman reclama un tesoro ( monedas de 50 pesos oro, alhajas, diamantes, documentos de títulos de propiedad) que dice haber bajo ese edificio dejado allí por sus ancestros Susana Wolfskill y Manuela Bringas en 1850 que tuvieron que esconderlo por miedo a los “hounds” que pululaban por el “Wild West” de entonces. In the weekly “Hispano-America” of San Francisco there is a note on February 6, 1926 (p. 1) in which it is said that a certain H.M Furman claims a treasure (coins of 50 pesos gold, jewels, diamonds, documents of titles of property) that it says to have under that building left to Lí by his ancestors Susana Wolfskill and Manuela Bringas in 1850 that they had to hide it for fear of the “hounds” that swarmed by the “Wild West” of then.